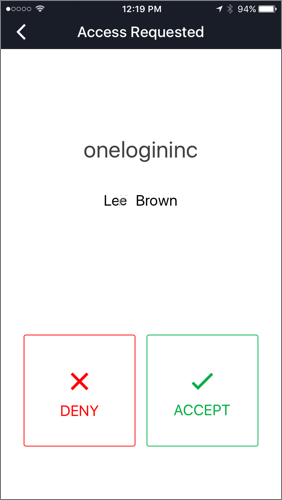 OneLogin Protect for iOS (formerly OneLogin OTP) is a mobile application that provides a one-time-password (OTP) as a second authentication factor when you log in, in addition to your OneLogin password. Your administrator can require a second authentication factor whenever you log in, when you log in away from your office, or when you log in to particular apps. For other supported devices, see OneLogin Protect for Android and OneLogin OTP for Windows Phones. Log in to OneLogin using your user name and password. The login screen notifies you that it's waiting for a one-time password. OneLogin sends a notification to your mobile phone or tablet, asking you to accept or deny the login request. Tip. You can also just slide your finger down the alert banner to expand it and select Accept or Deny directly from the notification. Note. To learn what happens when your phone is locked, see Push notifications on a locked phone. 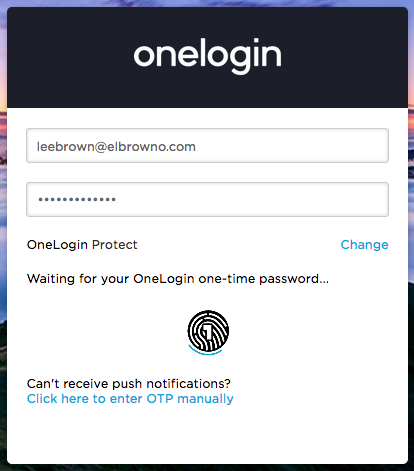 OneLogin Protect sends the OTP to OneLogin and logs you in. Sometimes you may need to enter the OTP code manually. This can occur if an error happened during the push notification or the time interval of the OTP code has expired or you do not have an internet connection. If you do not have an internet connection you will have to manually enter the OTP code into your browser login panel. If you do have an internet connection you can also press "SEND OTP" which is located under the OTP code display. "SEND OTP" will send the OTP code to the server and attempt to log in you in without you having to manually enter the OTP code. 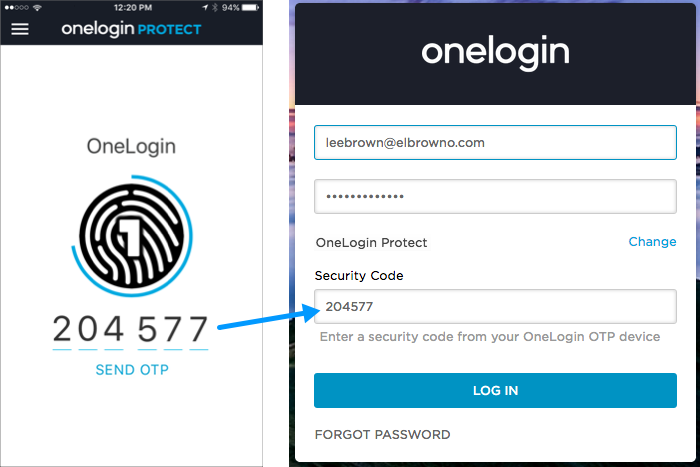 If you want to copy the OTP code to your clipboard, then press the OTP code within the OneLogin Protect OTP code panel and it will be copied to the clipboard. 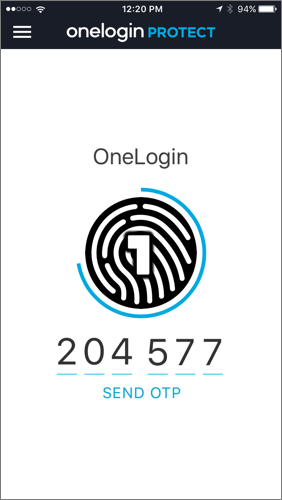 If your organization requires that you use 2-factor authentication (2FA) and has enabled OneLogin Protect as an authentication method, you will be prompted to set up OneLogin Protect the first time you log in to OneLogin. In a browser, log in to OneLogin. If you're required to use 2FA and you haven't set up an authentication factor, your login screen will prompt you to set it up. 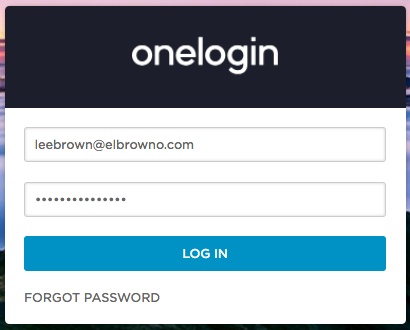 If your administrator enabled you for OneLogin Protect only, you don't have to select the authentication method; you'll see the above version of the login screen immediately after you enter your username and password. Make sure that iOS & Android is selected under Select Device. Install the OneLogin Protect app on your iPhone or iPad. Important! Your device must be connected to the internet for registration with OneLogin to succeed. Launch the OneLogin Protect app. Click Enable Passcode to go to the device setup page where you can enable Passcode or Passcode + TouchID. 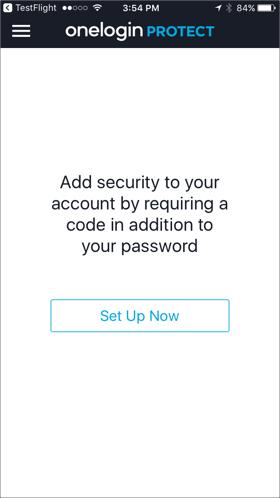 After you have enabled Passcode, return to OneLogin Protect to continue setup. On the welcome screen, click Set Up Now. 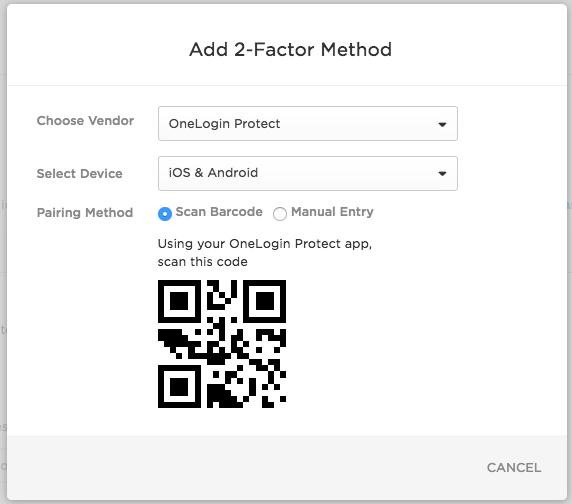 If you're prompted to permit OneLogin Protect to use your camera, click OK.
From the Scan Barcode screen, use your iOS device camera to scan the barcode on the Add 2-Factor Method dialog that is still open on your browser. Focus the box over the barcode. 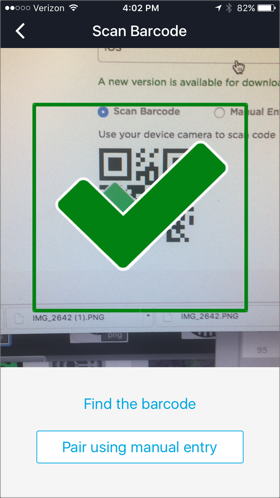 When the barcode is successfully scanned, a big green arrow appears inside the box, indicating that your device is paired (registered) to your OneLogin account. If you are prompted to Enable Push Notifications, click Enable. Full push-notification functionality requires that the app is fully enabled for notifications in the phone settings. Clicking Enable here configures those settings for you. Follow the login instructions in How it works and go to your Profile page to confirm that your iOS device has been registered as a 2-Factor Authentication method. 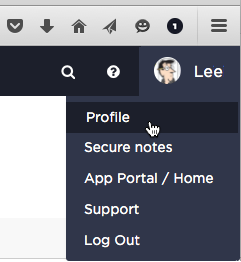 In your browser, select the Manual entry option on the login screen. On the Scan Barcode screen on your phone, click Pair using manual entry. On the Enter code manually screen, enter the 9-digit code displayed on the login screen. 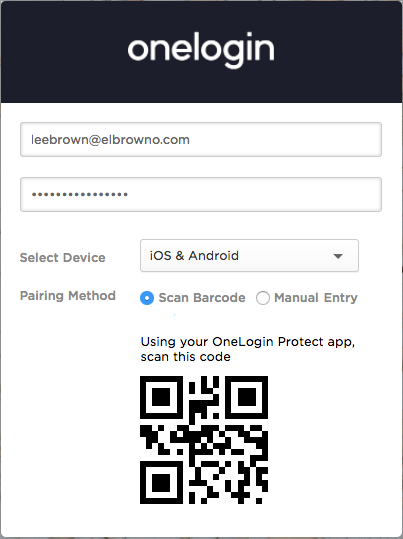 When your device is successfully paired to your OneLogin account, the OneLogin Protect home screen appears. 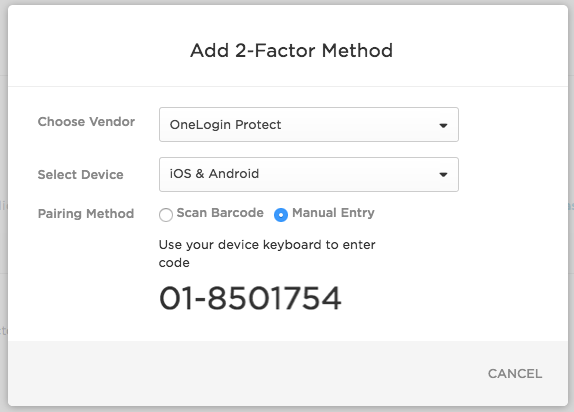 If you are not prompted to set up 2-factor authentication on the OneLogin login page in your browser, you can go to your user Profile page to set it up. We recommend using a laptop or desktop rather than the device on whicn you installed or updated OneLogin Protect. On the Profile page, click the plus sign (+) next to 2-Factor Authentication. On the Add 2-Factor Method dialog, select your vendor and device type. On the Choose Vendor drop-down, select OneLogin Protect. On the Select Device drop-down, select iOS & Android. On your iPhone or iPad, go to the App Store. Focus the blue box over the barcode. When the barcode is successfully scanned, a big green arrow appears inside the blue box, indicating that your device is paired (registered) to your OneLogin account. Confirm that your iOS device has been registered as a 2-Factor Authentication method on your Profile page. 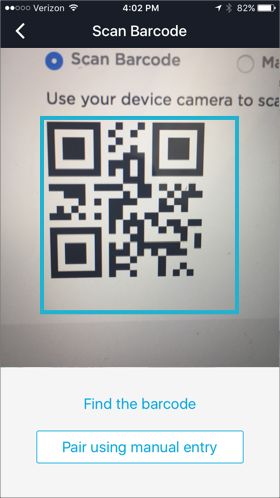 Click Pair using manual entry on the Scan Barcode screen. On the Add 2-Factor Method dialog that is still open on your browser, select Manual Entry. 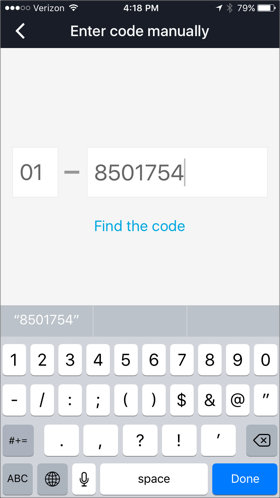 On your device, enter the 9-digit code displayed on the Add 2-Factor Method dialog. 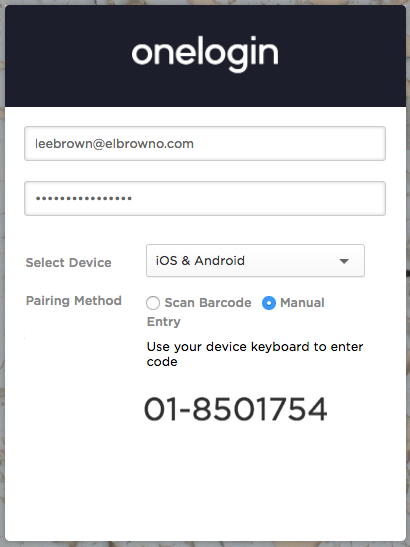 If you're already running OneLogin Protect and you've already paired your device to your OneLogin account, you don't have to re-pair the device after you update to the latest version. Find the OneLogin Protect app in your app list. Important! Your device must be connected to the internet for unpairing with OneLogin to succeed. On your iPhone or iPad, open OneLogin Protect. 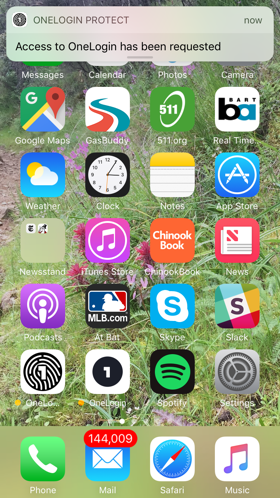 Swipe right or click the three-bar menu icon to open the menu tab. 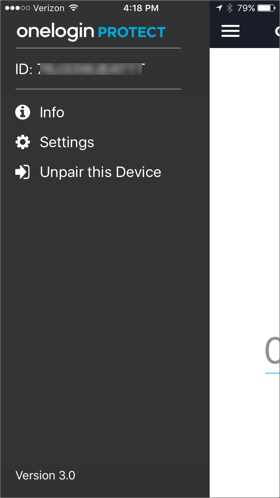 Click Unpair this Device, and click Unpair at the confirmation prompt. Go to your user profile menu and select Profile. On the Profile page under 2-Factor Authentication, find the OneLogin Protect row and click Revoke. Swipe left and click View. Unlock your device using your passcode or Touch ID. OneLogin Protect logs you in to OneLogin once you've unlocked your phone. After you have enabled the Passcode feature, return to OneLogin Protect to complete your task. If you are setting up Protect for the first time, this means continuing setup. If you already use OneLogin Protect, then this means accepting a push notification or copying an OTP code. You can ignore a OneLogin Protect access request notification on a locked device by swiping left and clicking Clear. 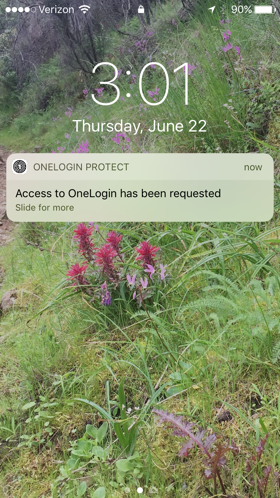 You can deny a OneLogin Protect access request by clicking Deny at the notification prompt or request screen. When you deny a request, an event is logged so that your OneLogin administrator is aware of the denied request. Make sure you're on OneLogin Protect, not OneLogin OTP. Go to Settings on your phone or tablet, scroll down to the app list, and select OneLogin Protect. Turn on the Camera toggle. Turn on the Allow Notifications and other toggles on that screen. Set Alert Style When Unlocked to Banners or Alerts. 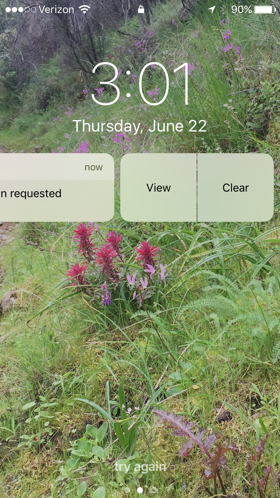 After awhile, the request notification is no longer valid. Instead of saying "Waiting for your One-Time Password..." your login screen will prompt you to enter your "security code" manually. Just enter your OTP manually, and you'll be logged in. Any given OTP works just once. And it takes up to a minute to generate a new OTP. 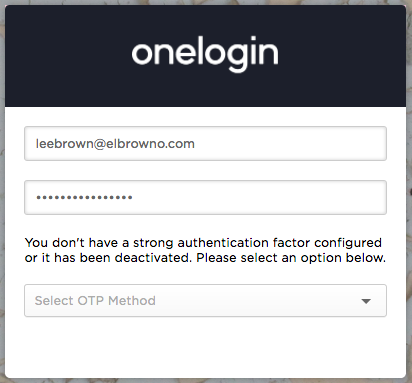 Just wait for a new OTP to be generated and press Send OTP from the OneLogin Protect app or widget. Go to Settings > Authentication Factors and add OneLogin Protect as an authentication factor for your OneLogin account. Security Tip. For OneLogin Protect 3.3 and up, you can require that your users secure their devices using the Passcode feature. 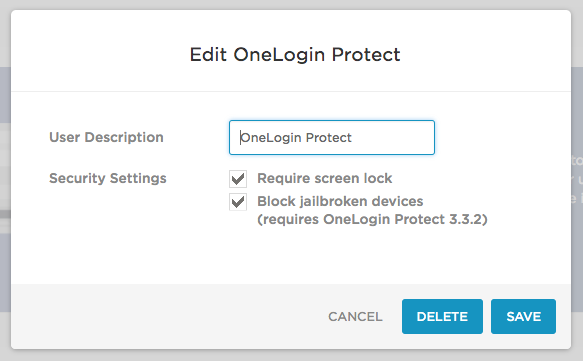 For OneLogin Protect 3.3.2 and up, you can also prevent users from using OneLogin Protect on a jailbroken phone. We strongly recommend that you enable these options. For second-factor authentication with OTP to provide a strong second line of defense against intrusion, the device that hosts the OTP app must itself be secure. You don't want a stolen password and a stolen phone--or a cloned phone--to provide easy entry to your OneLogin user account. To enable the Passcode requirement, select Require screen lock when you configure OneLogin Protect. To block jailbroken iPhones and iPads, select Block jailbroken devices when you configure OneLogin Protect. 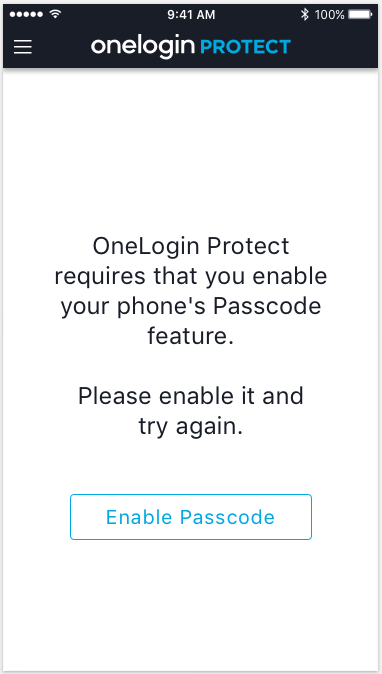 Any user who hasn't secured their device using Passcode or Passcode + TouchID will be prompted to do so when they install or try to use OneLogin Protect. Go to Settings > Policies and add OneLogin Protect as an authentication factor for a user policy. Assign the user policy to Groups or individual users. For complete instructions, see Adding Multi-Factor Authentication. 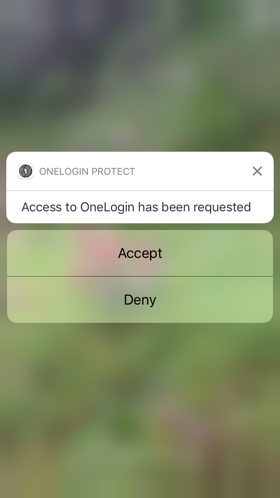 When a user has denied an authentication request sent to their device by push notification, an event is logged in your OneLogin account, called <Username> Denied Auth Via OTP Push Request. You can view these events at Activity > Events. Go to Activity > Notifications. Click the New Notification button.